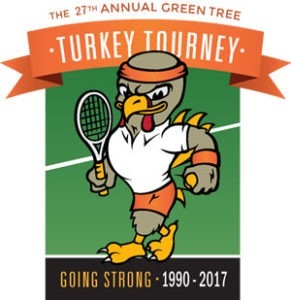 In its’ 28th consecutive year, Green Tree’s “turkey” tourney stands out as engagingly unique and one of the cities most enjoyable and popular tournaments! Turkeys and cornish hens are given out as first and second place “prizes”. The tournament is known for its competitive play and most importantly, the all important “Turkey” shirt! The “ Turkey Tournament” is a tournament for San Antonio. It is for all levels of players to include adults and juniors. It is not sanctioned and therefore is not to be played for a “ranking”. Rather the tournament is played as a celebration of the competitive spirit and the love players have for the game of tennis. Local teaching professionals as well as many of our San Antonio High School coaches participate. In her 28th consecutive year as tournament director, Courtney P. Mayer boasts over 30 events that include players of all levels ranging from 2.5 levels to “open” play. The open divisions showcase the best players in town including tennis collegians from UTSA, Trinity University, St. Mary’s University, Our Lady of the Lake University and Incarnate Word University! In addition, many of San Antonio ‘s outstanding junior players compete as well as international players from the John Newcombe Tennis Ranch Academy . We hope you will join in on the fun! Happy Thanksgiving! Oh – and one last thing . . . WELCOME TO THE “ TURKEY TOURNAMENT”!